The CD109 antigen is a monomeric glycosyl phosphatidylinositol (GPI)-linked glycoprotein of 170 kDa that contains several N-linked endoglycosidase H-sensitive hybrid-type glycans but no O-linked glycan. It has been reported as a novel member of the α2 macroglobulin (α2M) / C3, C4, C5 family of thioester-containing proteins. The CD109 antigen is found on vascular endothelial cells, some epithelial cells, activated, but not resting, T-cells, activated, but not resting, platelets, leukemic megakaryoblasts and a subset of bone marrow CD34+ cells. This antigen is not expressed on fresh peripheral blood lymphocytes (PBL). Poorly differentiated (CD34+, TdT+, CD7+) T-acute leukemias and rare cases of chronic myeloid leukemia in megakaryoblast crisis express the CD109 antigen. Furthermore, megakaryoblastoid cell lines (MO7e, MOLM-1) are CD109+. 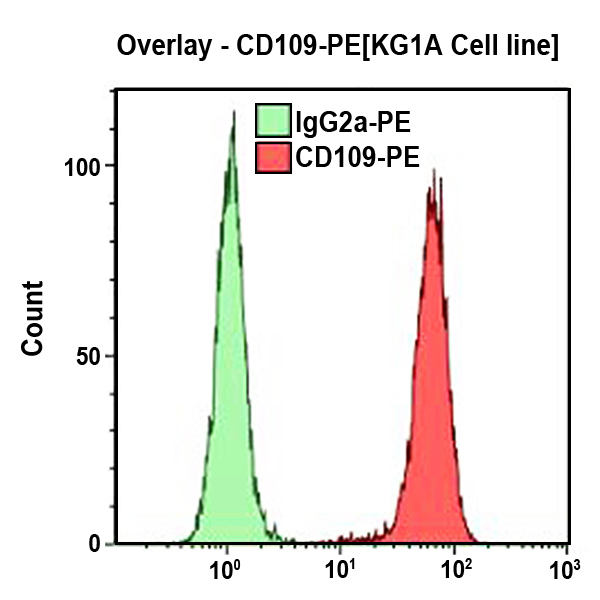 The CD109 antigen, strongly expressed on KG1a cell line with 20,000 binding sites per cell, may represent a very early marker for hematopoietic cells committed to the megakaryocyte lineage. In contrast, the adult bone marrow CD34+ CD109+ subset identifies the most primitive hematopoietic stem cells capable of long-term culture and lymphoid progenitors of the B-cell lineage.